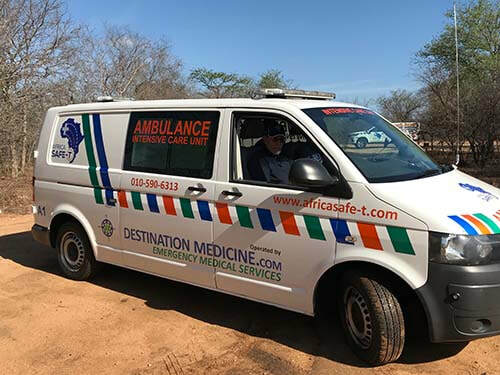 After a much awaited launch Africa Safe-T together with Destination Medicine introduced to Hoedspruit its first and very own Advanced Life Support ambulance at the beginning of December. The ambulance is equipped to an intensive care unit (ICU) level. The ICU ambulance is operated in association with a fixed wing air ambulance company based in Johannesburg. Furthermore, an agreement is in place with the largest provider of helicopter emergency medical services in the country, which has a day light operating helicopter in Nelspruit as well as a 24-hour helicopter in Johannesburg. 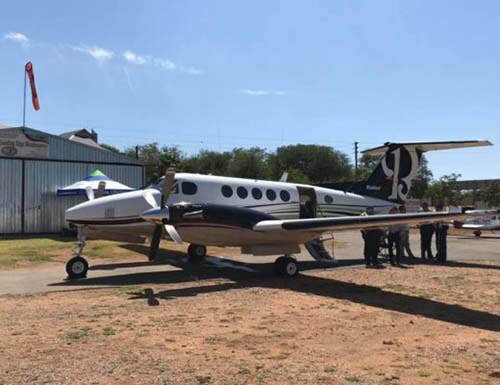 The fixed wing aircraft can get to Hoedspruit in two hours from the call being made, with a one hour dispatch time and a one hour flight time. 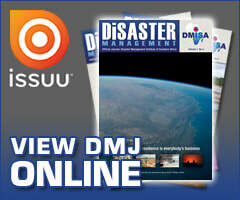 This means that a patient can be in hospital in Johannesburg within three hours and 45 minutes. The time being slightly longer (five hours) if the helicopter is used. This means that critical patients in need of advanced and specialised care can rapidly be evacuated to the most appropriate facility. “We will transport the patient to the nearest appropriate facility. By this we mean, for example, there is no cardiologist in Tzaneen so we would transport a patient suffering from a serious heart condition to Nelspruit,” says Lucien Newman, Africa Safe-T’s executive director. Africa Safe-T was founded in Hoedspruit in 2006 and was the first emergency medical response service to have opened in town. 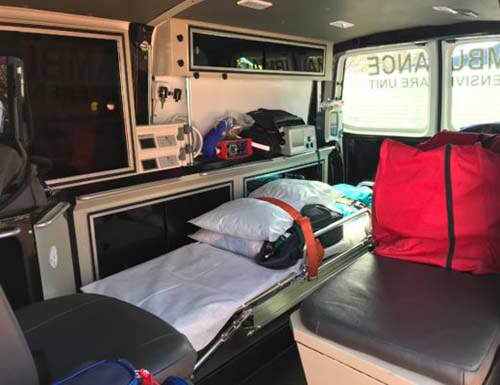 Previously, the highest level of care in terms of ambulances for the Hoedspruit region had been Intermediate Life Support but the type of medical care that can be given at an intermediate level is limited. Intermediate life support practitioners cannot carry heart medication or allergy medication, to name just a few of these limitations. Advanced Life Support Practitioners are able to perform advanced emergency medical procedures and are able to use a large range of lifesaving medications for cardiac conditions, allergic reactions, respiratory distress, seizures, and others. They also have the ability to effectively manage pain through strong analgesic medications. Intermediate Life Support Practitioners do not have access to these medications nor can they perform these skills. The ICU ambulance is a public resource and available to any member of the public when it is in town and available. 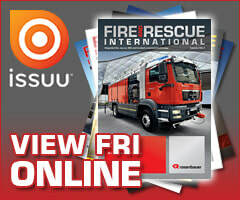 This differs from all of Africa Safe-T’s previous services which have only been offered on a membership basis only. Their other services still remain purely on membership and the community must take note that Africa Safe-T’s medical response vehicle will still only respond to their active members, even if the ICU ambulance is out of town, as they are obliged to maintain 24-hour a day availability for their active members. Many people assume that Advanced Life Support implies high costs. This is however not true. The ambulance will only ever charge for the level of care provided. The ambulance and air ambulance services are registered with all the South African medical aids and with the Road Accident Fund. Under the Road Accident Fund, non-medical aid or insured passengers of the vehicle will be treated and transported to an appropriate hospital and the Road Accident Fund will be billed directly, not the patient. Drivers are not covered by the Road Accident Fund, however most car insurances include emergency medical cost coverage for the occupants of the vehicle. In addition, Africa Safe-T is planning to cover the costs to install lights to the airfield in Hoedspruit in January, this will mean that the fixed wing aircraft can land 24/7. At the time of going to press, Africa Safe-T’s ICU ambulance had already responded to 14 call outs since its launch at the beginning of December, this equating to a call out rate of one per day. Certainly this service is much needed in the area and will provide the residents of Hoedspruit with a medical service on a level never before seen. The ambulance services an approximate area that extends to Strydom Tunnel, Phalaborwa, Orpen and Satara areas of Kruger and Acornhoek.